Olympia High School girls soccer coach Tamara Liska made a promise to her players that once the postseason kicked in she’d color her hair blue in support of the Bears. If this wager would have been made last season, Liska’s locks would be free of any dye as Olympia struggled, winning just three games and never getting within striking distance of the playoffs. This season saw quite the turnaround as the Bears matched their win total from last year in playoff victories alone, winning three distance contests, including a pair of loser-out games, to advance to the Class 4A state playoffs for the first time since 2015. 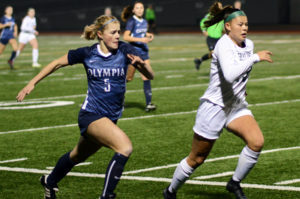 Olympia’s sensational season came to an end, however, in the opening round of the state tournament as the Bears lost 3-0 to a battle-tested Skyline squad at Ingersoll Stadium on November 7. The Bears finished their campaign with an 11-6-2 record with one of the highlights of the season coming in a 2-1 victory over 4A South Puget Sound League champion Puyallup to secure the 4A West Central District’s No. 1 seed into the state tournament. 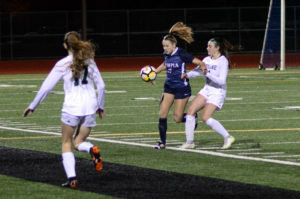 Puyallup, which defeated Richland, 2-0, in the first round of the state playoffs, entered the district match against the Bears unbeaten in 17 games with a stellar 15-0-2 record. One of the Vikings’ victories on the year came at Olympia’s expense during the regular season with 4-1 triumph on September 25. The loss kick started a slide for the Bears where they would go 0-5-2 over a seven-game stretch. Not deterred, the Bears quickly righted the ship and started to play their best soccer when it mattered most. 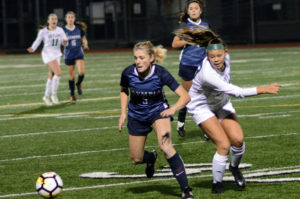 They ended the regular season with a 2-2 tie against Puyallup before shutting out eventual state quarterfinalist Bellarmine Prep, 1-0, to take some momentum into the postseason. After finishing fifth in the 4A South Puget Sound League, Olympia headed into the playoffs. The Bears defeated Enumclaw, 2-1, in their first of two consecutive loser-out games, getting a goal from junior Lauren Foster then winning the match on PKs, 3-0. Up next was 4A North Puget Sound League Olympic Division Auburn Riverside, a team with only one loss and one that featured loads of offensive firepower, having scored a combined 17 goals in their previous two games before facing the Bears. 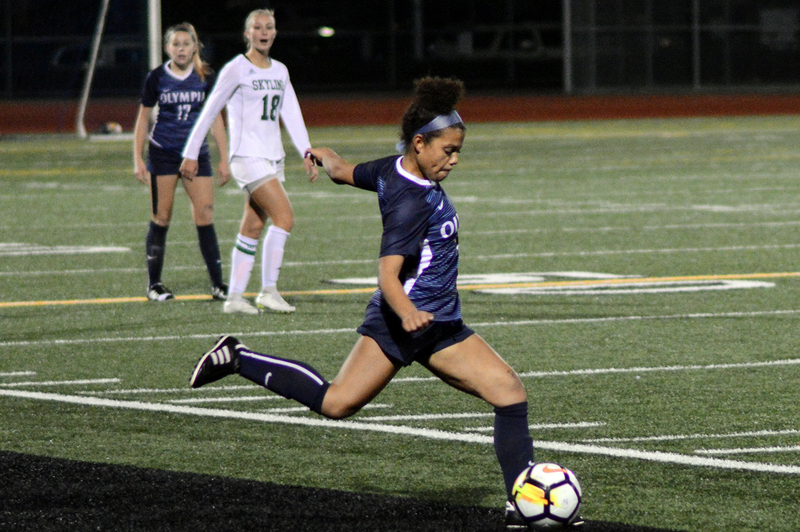 Behind an outstanding effort by junior goalkeeper Lyric Tinnel and the Olympia defense, the Bears ended the Ravens season with a 2-0 shutout. Two seasons ago the Olympia boys’ soccer team surprised the state by finishing in the middle of the 4A SPSL before stringing together a handful of major playoff upsets to punch their ticket to the state playoffs. This year, it was the Lady Bears’ turn as they duplicated the feat with their 2-1 win over Puyallup to secure the district’s top seed. 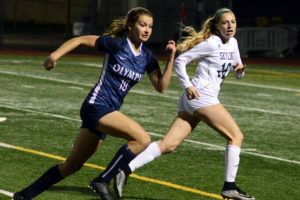 In the first round of the state tournament, Olympia played visiting Skyline, which has won four state titles over the last decade and was making its 11th consecutive state playoff appearance, to a scoreless first half. The Spartans were able to break through in the second half, getting goals in the 50th, 62nd and 74th minute to put an end to the Bears’ season. It marked the final match for six Olympia seniors – Gabrielle Beatty, Paulina Courter, Chloe Gentry, Keila Kruse, Sophia Nicholoson and Annelise Taylor. 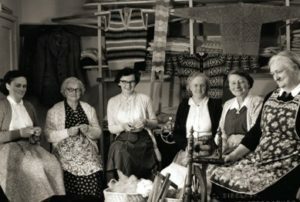 Next article‘Downtown for the Holidays’ is brimming with Fun: Jingle Bell Parade, Visit with Santa, Tree-Lighting, Bell Chiming, Gingerbread Houses and Ice Skating…Whew!